The death of Crab’s fellow officer by cannonball you cannot forget. I have tried to find the officer’s name. Lt. Cherry does not say in his memoir. H. Pfanz, Gettysburg – The First Day, p. 256 (Chapel Hill: Univ. Of North Carolina 2001). H. Thomas, History of the Doles-Cook Brigade, p. 87 (Atlanta 1903). It must have been Lane’s sword that Crab picked up after the cannonball struck. The sword did not come down to us. 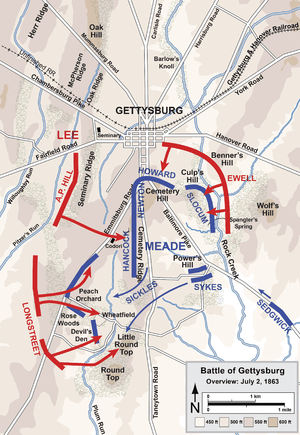 I witness’d during the three following days, July 2, 3, & 4, the famous fighting which took place of the two armies of Gen’ls Lee and Meade. It is said to be the greatest artillery duel that ever took place on this continent. at Williamsport, Maryland, where we recrossed the Potomac River — having to wade it to our armpits. 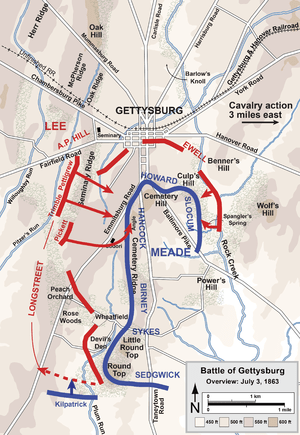 MAJOR: This brigade was formed into line of battle about 1 p.m. July 1, in front of Gettysburg, Pa. We occupied the left of Major-General Rodes’ division. The enemy’s cavalry picket appearing in force on our front and left flank, skirmishers from this command were ordered to dislodge him. After a short engagement, he was driven from his position, when we occupied his position (a hill to our left), about 3.30 p.m. The enemy moved his force from our front, made a strong demonstration on our left, driving our skirmishers from the hill from which we had driven him. The command was then moved by the left flank, to meet any attack the enemy might attempt on our left and rear. We found the enemy strongly posted, with infantry and artillery, on the hill from which our skirmishers had been driven. The brigade of General Gordon, of Major-General Early’s division, having made a conjunction with our left, we moved forward to attack the enemy in his position. Our effort was successful. He was driven from behind a rock fence, with heavy loss in killed and wounded, and a large number of prisoners sent to our rear. We suffered severely from the enemy’s batteries and musketry in this attack. changed our front to meet this force. 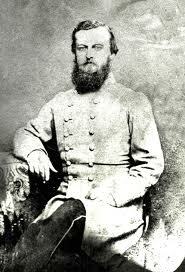 General Gordon continued the pursuit of the enemy toward the town. We met the force on our right, attacked and routed him, pursuing him across the plain in front of Gettysburg. But few of this force escaped us. We then moved toward the theological college, to the right of Gettysburg, where the brigades of Generals Daniel, Ramseur, Iverson, and Colonel O’Neal were engaged with the enemy. As we advanced toward the enemy, our position at that time being on his right flank, the enemy withdrew his forces from the college hill to the railroad. We then moved rapidly by the left flank, to cut him off from the town. We did not succeed, as he retired faster than we advanced. We followed through the town as far as the outer edge of town, when I received an order to halt the column, and to form line of battle in the street running east and west through the town. We remained in line here until about 8 p.m. July 2, when we moved by the right flank, forming line and advancing toward the enemy’s position on Cemetery Hill. This column of attack was composed of Generals Ramseur’s, Iverson’s, and this brigade. We moved forward until the line arrived within 100 yards of the enemy’s line. After consulting with Generals Ramseur and Iverson, the line was ordered to fall back to a dirt road some 300 yards to the rear. We remained in this position until 1 a.m. July 4. We were then ordered to fall back to the heights near the theological college. This command was actively engaged in heavy skirmishing during July 2, 3, and 4. In the action of July 1, Lieutenant-Colonel [D. R. E.] Winn was killed and Lieutenant-Colonel [S. P.] Lumpkin fell, severely wounded (leg since amputated), while gallantly leading their respective regiments in a charge against the enemy. . . . I have the honor to report and return one flag captured by the Twelfth Georgia. We lost no colors. The brigade went into action with 131 officers and 1,238 enlisted men; total, 1,369.